Every summer since his mother died of cancer, Blaze Werla has created an imaginary friend and subsequently buried him in the backyard. This summer, after the yearly burial, someone begins leaving messages made of stones on the hill behind Blaze's house. First, he sees his mother's name. Later, the messages become more personal. He suspects his father's new girlfriend, in whom he has confided, might be the one leaving the words of stone, but while he decides what to do about it, he surprises himself by making friends with Joselle Stark. Joselle herself is troubled by her own absent mother, and as she and Blaze grow closer, she realizes she must tell Blaze an important truth if they are to be true friends. Like Henkes's more recent novels such as Olive's Ocean and Junonia, Words of Stone is a quiet, introspective story. Blaze and Joselle are both sensitive kids who have endured their share of pain and confusion, and because of this, much of the story takes place inside their heads. (Though the narration is all in the third person, the chapters alternate between the two characters so we know both of their thoughts.) Outside events do influence their internal struggles and triumphs, but there is very little physical action. This is definitely a literary novel, where the language and word choice are the most prominent features. It reads like a lot of the serious fiction (The Cay, The Lottery Rose) I was assigned in late elementary school. The writing is lyrical and at times, almost eerie, as Blaze reflects on his mother's death and on the accident he had on a ferris wheel. His toy Noah's Ark and the graves of his imaginary friends are powerful images that represent his pain and his loss, and it is Henkes's use of these symbolic objects that makes the book stand out. I would be surprised if this book had ever become super popular, because it dwells so much on the emotions of its main characters. There are readers, though, who are not satisfied by fast-paced action novels, like the Percy Jackson series, or by cruelty thinly veiled in humor, like the Wimpy Kid books, and I think it is those more serious readers who appreciate Henkes's style. Kids who mourned the loss of a parent, or who have trouble making and trusting new friends will empathize strongly with Blaze's loneliness. Those who have grown up reading Henkes's picture books will be pleased to see that his writing for older children continues to provide validation and support for the myriad challenges of growing up. 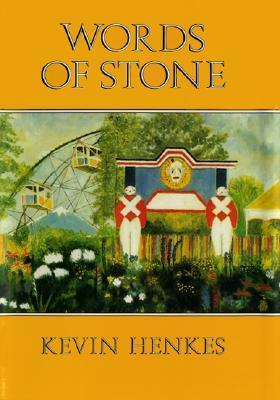 Words of Stone was published in 1992, and it is still in print. The cover of the most recent edition is much better suited to the story than the cover of the edition I read (shown at the top of this post), and I think kids would be interested in picking it up. It is a great read-alike for As Simple As It Seems by Sarah Weeks, Remembering Mrs. Rossi by Amy Hest, and The Last Best Days of Summer by Valerie Hobbs.